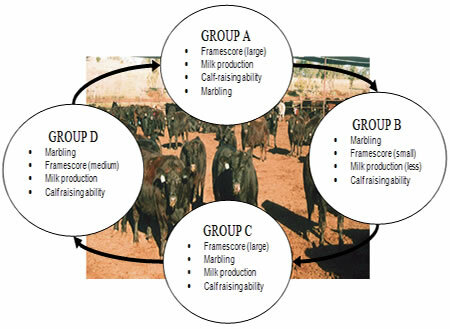 Under Mr. Takeda’s four-stage rotational breeding plan (see summary graphic below), the emphasis is put on building frame score first, and then marbling. Mr. Takeda maintains that a breeding program based on his rotation technique is more likely to deliver the best overall profitability in the long term. For each of the Groups: A, B, C, and D, Mr. Takeda lists the traits in order of priority and significance. Notes: F1 breeders should use sires from Group B and Group D ONLY. FB breeders should cull non performing female offspring from AxB and CxD matings.